I swear, this 16th pound is just a bugger. But beyond the scale, let me just tell you how amazingly this last week went. I met my weekly goals. Ok, most of them. I was not as active as I wanted to be this weekend. And I got into a few situations with food and traveling that meant I had to go over my points for the day or didn’t get as many steps in as I had been anticipating. But I did the best I could with what I was given and with utmost intentionality. And amazingly enough, I didn’t beat myself up about it. I am really proud of the choices I made this week. And let me tell you – choosing mindfulness and acceptance rather than guilt and shame feels amazing. I already knew walking into the meeting this week that I was probably not going to be thrilled with what I saw on the scale. Because (sorry guys), it’s shark week at my house and we all know that means bloating and water retention and weight gain and moodiness and zero desire to do yoga. Thanks a lot, hormones. (Surely, just another facet of the curse, right?) I think this cartoon I stole from 22 Words pretty much sums it up. But somehow, by the grace of God, I didn’t let it stop me from riding this train of being kind to myself, accepting setbacks, and choosing to continue making the best possible choices and not punishing or berating myself when I inevitably screwed up. And so I will proudly claim the minuscule amount of weight that I lost this week and choose gratitude. Because it could have been much, much worse. And it wasn’t. In fact, I feel great. Thank you, Jesus. The Numbers: Down. -0.4 lbs has never felt so good. Thank you very much. 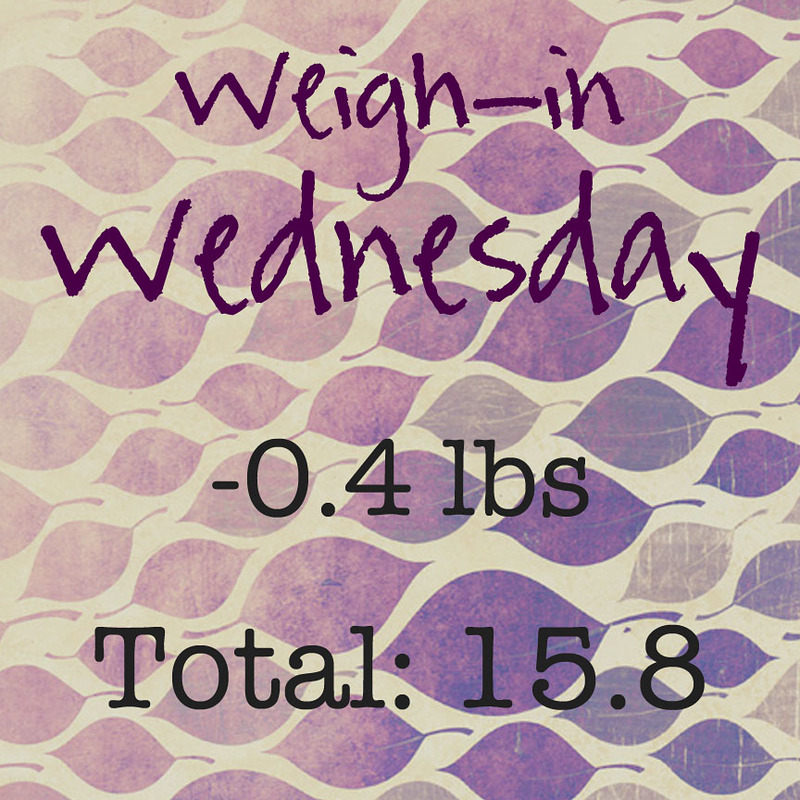 Non-Scale Victories: This is a big one for me because this one is a major accomplishment in terms of my “why”. I went down a whole category in the BMI chart! Now, I celebrate this knowing that the BMI chart is wildly inaccurate and even doctors concede it’s not really the best judge of an individual’s overall health. Buuuuut they still use it. And because they still use it in the midst of my childbearing years – so must I. Can we all just take a minute to acknowledge how ugly the words “morbidly obese” are? I was in that category of the BMI chart when I started. AND I’M NOT ANYMORE!!! I’ve got a long way to go yet before I reach my target range. But this is a very big step in the right direction and I am just so thankful. I also rocked my 8 glasses of water a day EVERY DAY this week. And I bought smaller yoga pants this week. New. From Victoria’s Secret. And they had my size. And that size was smaller than anticipated. Six months ago, I was crying because they didn’t carry my size in stores like that. Little changes yield big changes. Every little thing counts! This Week’s Goals: Continue practicing acceptance, kindness, and taking thoughts captive. 8 glasses of water per day. Go for more walks. Catch up with the SGC ladies (and one very active pastor’s kid) in the Fitbit Workweek Hustle. Back to yoga! LOL that cartoon made me laugh! Isn’t it weird how certain pounds tend to stick around? For me, it was 147- that bugger took weeks to get rid of! Aww thank you so much, you are too sweet!